This is prepared during Chithirai Varuda Pirappu/ Tamil New Year, but the people who hail from Tanjore district. This is done specially from fresh neem flowers. Fry neem flower in 1 tbsp of ghee till it turns red in colour. (care should be taken as to not to burn the flowers). In a pan add the remaining ghee and oil and when hot add teh mustard seeds. When they splutter add the red chillies, asafodeita, curry leaves. Add 2 cups of water to tamarind paste and make tamarind water. Add it to the pan along with the salt. 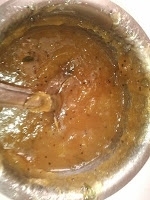 When it comes to a boil add the jaggery and mix well. In 1/4 cup of water mix the rice flour and make a paste of it and add it to the pan. When everything comes to a boil remove from flame.